Revive Bath & Body: Let the countdown begin. It's official! I just received my packet with all of my show information in the mail. Only 16 days until my first show!! Talk about butterflies; I even had a dream about the show! 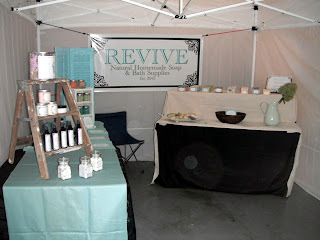 Well this past weekend, I did a mock set up of how I want my tent/display to be at the market. What do you guys think?! Inviting? I got the old ladder at a garage sale, along with one of my tables. My mom is letting me borrow the other table. My church actually printed my banner for me so talk about cheap! I got it done for $15. What a steal!! My sister also had a good idea, a bubble machine! This will attract buyers, as well as keep kids entertained, what do you think? I would have the machine on a small table in the front of my booth allowing the bubbles to blow out into the people walking by. My neighbor has one that is battery-powdered, so maybe she will let me borrow it!! My my, so many things have changed since the last time I posted a blog update! Well firstly, I turned 19 on September 28th! That's right, another year older. Last week I also had three tests, one paper, and one midterm. Now ya know why I haven't updated in awhile? Haha but good news, I got a 102 on my math test and an 83 on my political science test. Not sure about my other grades, but so far so good! I interrupt this message to bring you something totally awesome, something totally funny, and something you totally have to see! Gotta run!! Let me hear all of your feedback about my display! Any craft show tips or advice would be really helpful! My next posting will be about a brand new item I am adding to Revive! Keep a watch out! I think it looks great! I really like the ladder and I think, considering what you sell, the bubble machine is a great idea. It looks fantastic! Your banner too! Thank you for posting on my blog thread. Love the display looks so inviting and really captures your brand. Looks fabulous!